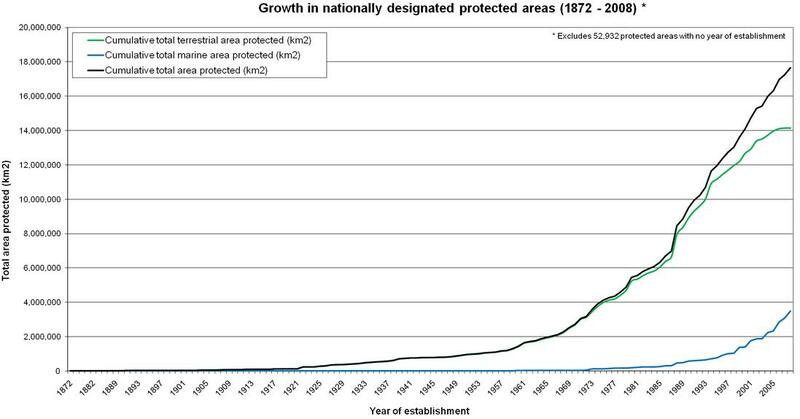 This chart (click to expand) is from the World Database on Protected Areas which is used to report progress towards Goal 7 of the UN Millennium Development Goals. Notice how new an idea marine protected areas really are? I’d say we’re just starting to hit the take off point. Here are the biggest MPAs in existence according to the latest MPA News. Pretty interesting that U.S. dominates the Northern Hemisphere. Having the largest EEZ in the world does not mean you’ll top the charts. Australia, which has the 3rd largest EEZ, isn’t even on the list.